Mythology says that the Sun was made of lemon cream. And on day a young man (Frank) went to the Sun to find out and to eat it if it were. But the Sun didn’t want to be eaten. So Frank made a deal with the Sun. As long as the Sun showed its face in Anacortes at least 3 months out of the year Frank wouldn’t eat it, and in return he would make a muffin resembling what the Sun ought to be to honor it and their pact. 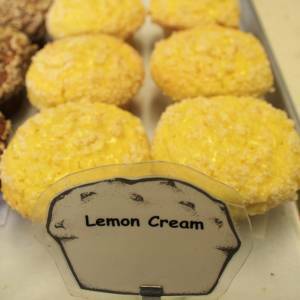 So he created the Lemon Cream muffin. A solar symbol if you will that your world can revolve around!